After years of following the movements of, not just a couple of favorites, but the industry as a whole, reading between the lines of PR enthusiasm, tracking the rhythm of successive delays and registering the progress (or lack thereof) of a title under development, you acquire a sort of sixth sense. 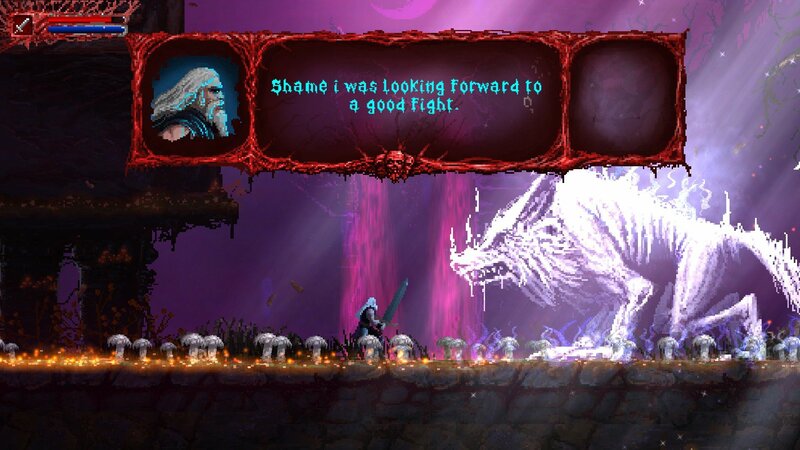 Slain!‘s endlessly shifting release date had been a running joke for months now, to the extent that when I requested it, fellow reviewer Joshua Kowbel, who had already been assigned to it long before I started writing here, was happy to pass the opportunity along, both of us doubting whether we would ever see it finished. Yet, I kept hoping against hope that something worthwhile would miraculously emerge out of what was undoubtedly a troubled development process. 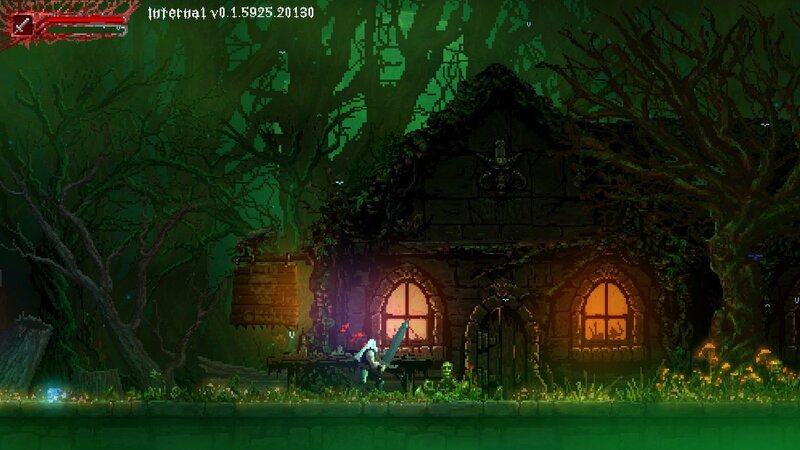 I love old-school Castlevania tributes like The Curse of Issyos, and Blood of the Werewolf proved you can make a decent game out of lycanthropy. Also, would you just look at these gorgeous screenshots? Well, Slain! has indeed been released, but it’s a complete and utter mess, so count me wrong on both accounts. First impressions were somewhat positive, no doubt helped by lowered expectations. The introductory level, Bloodgrounds is probably the most fun one can have with the game. This is not just due to the fact that it mostly lacks the bugs and design missteps plaguing every other area, but also because the realization has yet to dawn that almost every enemy encountered in the game, including several of its bosses, can be killed by spamming the crouched attack. Exploiting the crouch attack, its faster delivery and the near immunity it provides you to ranged and area attacks is more than an option, it’s a necessity. Except for the basic offense, other moves are entirely useless. The beheading whirl is extremely slow and relatively weak, its only advantage being that it may grant you a small quantity of mana. However, you can find mana elsewhere, like in vials and armors strewn throughout each level which provide it in larger amounts and involve none of the risk. The backdash, meanwhile, seems more like a tacked-on Castlevania reference than a properly thought-out mechanic. It is slow to activate and rather short to travel; simply turning around and walking back a couple of paces feels like the more practical option. Standard attacks are ok, once you’ve acquired a pixel-perfect awareness of their range so your hit can land before theirs, but even then, why risk the slower delivery and increased exposure when it may lead to getting stun-locked by a pesky succubus, ganged up on by a bunch of skeletons, or one-shot by a fire breathing hellhound? The lack of meaningful variety in offense and the fact that most enemies are damage-sponges make combat an excruciating chore: the Anubis-like creatures of the Wolfwoods require thirty such hits to dispatch, the disembodied, hammer-wielding cyclopses of the Old Town require fifty, and you’ll have to go through plenty of either from one checkpoint to the next. Losing somewhere in between is a truly terrifying prospect because it entails going through the whole mind-numbing ordeal from the start. The towers, sub-sections of each level with an emphasis on platforming and basic puzzle-solving (i.e., hitting switches), offer a momentary reprieve from the dull grind, but have their own set of issues. In certain areas the backgrounds blend with the foreground so that it becomes extremely hard to discern where the platform ends and where the gap to death-by-lava-embrace begins. In others, switches will arbitrarily refuse to activate, promptly forcing you to restart from the last checkpoint and killing your progress. Difficulty is all over the place, with most sections requiring little skill to navigate and others needing absolute precision in order to land on the other side of a chasm and avoid the pummelling granite blocks below. In a game as visually impressive as Slain!, the one redeeming quality, the one prospect that could have kept you interested despite its numerous shortcomings, could have been its boss fights. Bad news: they’re as sloppy and broken as the rest of the game. The Ice Beast and the Thorn Monster are basically the same enemy with a different color palette. Both can be rendered entirely harmless by (you’ve guessed it) spamming the crouch attack. The Banshee Queen is more interesting-looking and thankfully bereft of their weakness (she hovers), but remains a predictable and unchallenging fight nonetheless. My encounter with the final boss, vampire-lord Vroll, on the other hand, bordered on the surreal. After finally catching up with him at the end of the Castle Bridge level, he performed the obligatory villain monologue, while a platform was raising both of us to the skies revealing a pair of red planets coming into alignment. When the platform stopped, he transformed into a dragon and proceeded to make Viking-flambe out of my character, all of which happened in a minute-long, non-interactive scene which subsequently cut to end game credits. Was it the true ending of the game? Probably not. One assumes there would be a fight and the corresponding achievement didn’t unlock. The former argument is more convincing than the latter though as, with just a single exception, all achievements refuse to be unlocked. The trading cards (still advertised as a feature in the game’s Steam page) are similarly nowhere to be seen. Curt Victor Bryant’s much publicized soundtrack is a nuisance, drowning out sound effects and paying no heed to whether you’re in-game fighting skeletons, between levels, or mutely despairing at another “You Have Been Slain” screen. It feels like your metalhead neighbor turned the volume up to eleven, rather than anything related to the game you’re currently playing and, if it’s a problem of implementation rather than composition, it still demands to be muted. The writing is awful too, full of spelling errors and immersion-shattering colloquialisms. Vroll is, at one point, kind enough to offer a “Thx” and the dialogue part of a majestic wolf spirit starts with a “Btw” – step aside Sif, gaming has found a new lupine favorite. At least the font chosen for the text is so awful that most of the time you’ll be unable to make out what’s written. Granted, writing is not the most important part of a 2D action slasher, but the lack of effort and conviction displayed by Slain! even at such a simple level is almost insulting. On the positive side, it does look very, very pretty. This review is based on a PC copy of the game.